Football’s a funny old game. One minute a team could be cruising, 2-0 up with 10 minutes on the clock. The next it’s two one with a nervy last nine. Those last few minutes can be painful to watch. Stoppage time endless and the inevitable equaliser completely ruining your wager. Thankfully, there’s a new wager that’s right up our street and one that makes so called ‘squeaky bum time’ a thing of the past. That comes in the form of 2 Up & Collect, a market offered by a number of bookmakers and one you really shouldn’t miss out on. WHAT IS THE 2 UP & COLLECT MARKET? Here at Bet and Skill we do our best to bring you the best football betting and in 2 Up & Collect we’ve found you one of the very finest. 2 Up & Collect is essentially a wager on the match result market but with a bit of a difference. If the team you back goes two goals up in the game, the bookmaker will pay out. That means no matter what the final score is, you’ll get your winnings if your team goes two up in the fixture. It’s a fantastic boost to your chances, and almost works as a type of insurance, just in case a two goal cushion does slip. HOW DOES THE 2 UP & COLLECT MARKET WORK? The 2 Up and Collect Market isn’t a difficult market to get the hang of and is helped by the fact it’s based around the most common market in football, the Match Result. It’s a market that isn’t offered right across football and is generally only found on selected fixtures across selected leagues. However, when it is offered it’s well worth playing. As mentioned above all your team needs to do is go two goals ahead in order to win before 90 minutes have been played. This can be done in a number of ways, with the game not necessarily having to start with a 2-0 scoreline. In fact, a team can even come from behind and you can receive the 2 Up and Collect payout. A team would give you an early payout if they went 4-2 up for instance, or 3-1, 5-3 and so on. Your team don’t have to win the game come full time either. Your selection might go 2-0 up and lose 4-2 for example, or perhaps draw 2-2. Because at one point in the game they were two up, you will win. Using Premier League betting as an example, let’s take a game between Manchester United and Arsenal. In this particularly game you’re going to play the Match Result market and a 2 Up and Collect market to back Manchester United. Of course if Manchester United draw or lose and they don’t go two goals clear at any point your bet will lose. WHICH BOOKMAKERS OFFER 2 UP & COLLECT BETTING? 2 Up and Collect is a relatively new market to the betting world so hasn’t been rolled out completely across all the biggest online bookmakers. However, there are still plenty of bookies offering it including Paddy Power and Bet365. 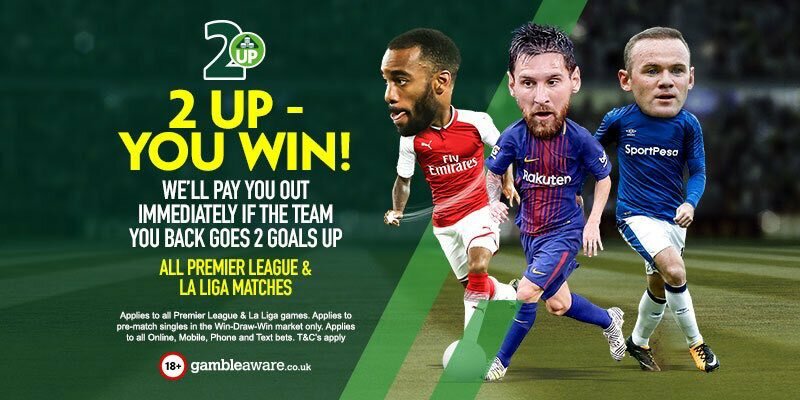 In terms of the former, their 2 Up Betting Offers is called 2 Up & Win and can be played across Premier League, La Liga and Champions League matches. bet365’s offering is a little more expansive, adding the Championship, Bundesliga, Serie A and domestic English cups to their offering on top of the three competitions mentioned above. IS 2 UP & COLLECT BETTING OFFERED IN OTHER SPORTS? There are a number of variations across sportsbook betting that are similar to 2 Up and Collect meaning you can get a good offer across multiple sports. As well as football, Paddy Power offer 2 Up & Win on tennis betting where if a player goes two sets up at any point the bookie will pay out. This works in the same way to football, meaning the player wouldn’t have to win in the end, simply to two sets up during the game. Paddy Power also offer it across rugby and NFL matches. William Hill and a couple of other bookmakers also offer a fairly similar wager in horse racing. This is most commonly found as well as football and pays out if a horse wins by two or more lengths. Obviously at this point the race has already finished so rather than paying out early, William Hill will give you an extra bonus should the horse finish the race by two lengths or more. "What Is The 2 Up & Collect Market? Our Early Payout Betting Guide"